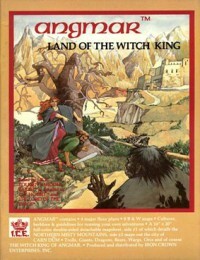 I suppose it takes a certain amount of chutzpah to set a role-playing game in Tolkien's Middle Earth but Iron Crown Enterprises had the moxie and they actually did a pretty good job of making it possible to play in the shadow of The Lord of the Rings. What's of greatest interest to me now and then (and it's why I still have it) is the end paper map of Endor - all of Endor, not just the Western coast. All the lands east of Rhun and south of the Haradwaith. I wish I could find a free-standing copy because the scale is too small to make it easily readable.